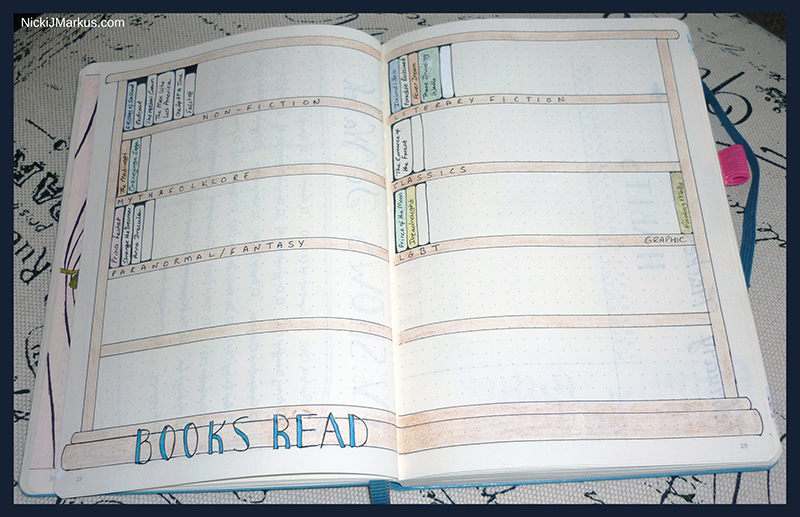 The first, and most obvious, BuJo reader spread is one to log books read during the year. There are plenty of options for doing this. I drew these bookshelves. When I get a new book for my TBR, I add it to the appropriate shelf. Once I’ve read it, I could it in. Simple! However, if all that drawing and colouring doesn’t appeal to you, or if you want to record more information (author name, rating etc.) you could set up a table-style spread instead. See what works for you. It will likely depend on how many books you read each year and how artistic you’re feeling. Are you someone who sees a book in a store or online, thinks “that looks great!”, then promptly forgets the titles? I’ve done that! Your bullet journal can help here if you make a book wishlist spread. Add works that interest you or for which you receive recommendations. Again, this could be a simple table to capture title, author, and perhaps the source if it’s a recommendation. Who doesn’t love a great quote? Now you need never forget them. Create a spread and keep note of your favourite quotes in your BuJo. This could be a straightforward note of the quote and attribution in a list, or you could take a more artistic path with fancy lettering and even accompanying illustrations. Thanks for stopping by. Sorry for the late reply; I've been out of town for a few days and am only now catching up with things again.